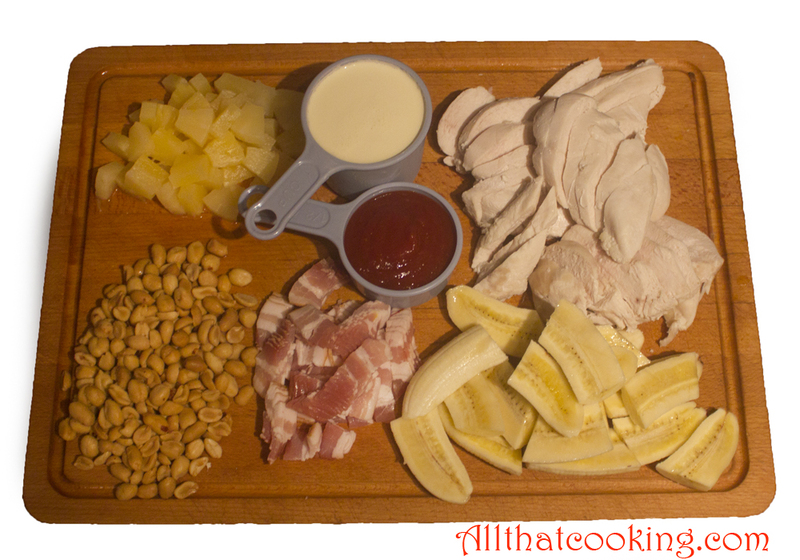 Question: What do you get when you combine chicken, bananas, peanuts, whipping cream, chili sauce and bacon? 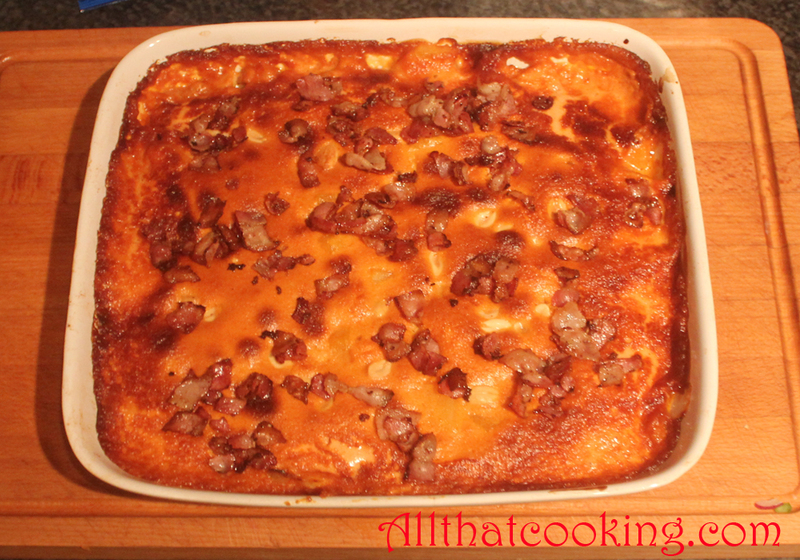 Answer: It’s what Oli served for dinner the other night and it’s a Swedish classic. That’s right. A Swedish classic right out of the 1970’s. Back then it was all the rage and appeared on restaurant menus throughout Sweden. Today you’ll find Flygande Jakob or Flying Jacob as it is called, still offered in luncheonettes, and in restaurants that serve traditional Swedish food. Anyway, this strangely unique dish is pretty darn tasty! 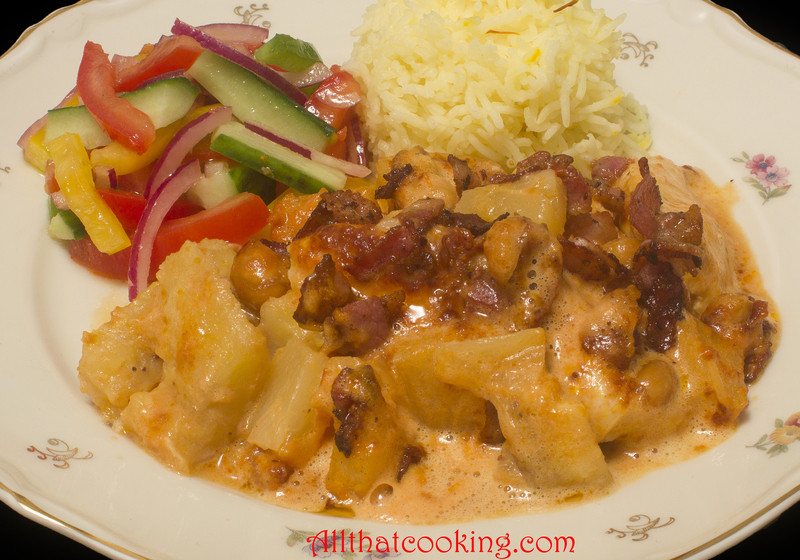 Layers of cooked chicken, sweet bananas, crunchy peanuts, slathered in a creamy, slightly tangy chili sauce, finished off with smoky bacon crumbles (everyone knows bacon makes anything taste better). . . The only thing missing for Oli was something to add a clean freshness. That’s where the pineapple comes in. This touch of the tropics lends a sweet, slight citrus sharpness that simply brings the whole dish together. It’s traditional to serve this with a salad and rice. Saffron scented rice makes a great co-pilot for Flygande Jakob. What can I say? This is really delicious! Be adventurous. Give it a try. Maybe use up some leftover turkey? Speaking of turkey. . . we want to wish everyone a very Happy Thanksgiving! If you’re looking for something different to serve this year check our very first blog post: Turducken for Thanksgiving. There’s another early post that you might like as well: Cranberry Persimmon sauce. Thank you to all of our visitors, blog followers, family and friends who have made this past year fun, rewarding and a most enjoyable part of life’s journey. Here’s to the next 365 days and the journey that awaits. And now without further ado we give you. . .
4 bananas, peeled, split lengthwise and cut into thirds. 1. Poach the chicken. Bring a large soup pot of salted water to a boil over high heat. Add chicken and bring back to boil. Reduce heat to medium and simmer for 10 minutes. Remove chicken to a plate. When cool enough to handle cut into 1/2-inch slices. 2. Grease an ovenproof dish with butter. 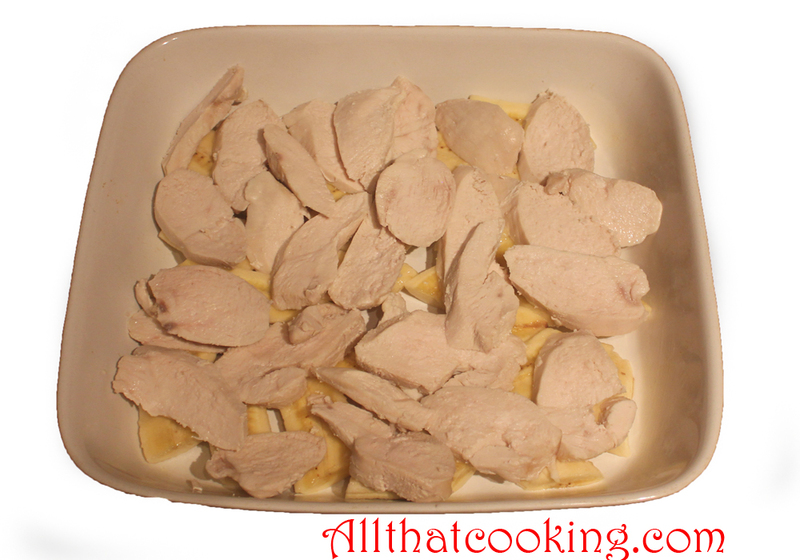 Cover bottom with bananas then top with chicken. 3. 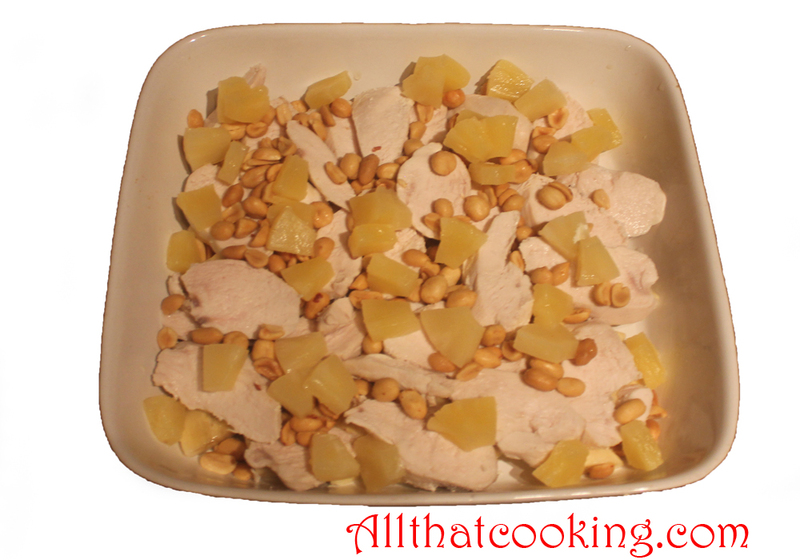 Scatter pineapple chunks over chicken and strew three quarters of the peanuts over this. 4. Pour chili sauce and whipping cream into bowl of stand mixer. 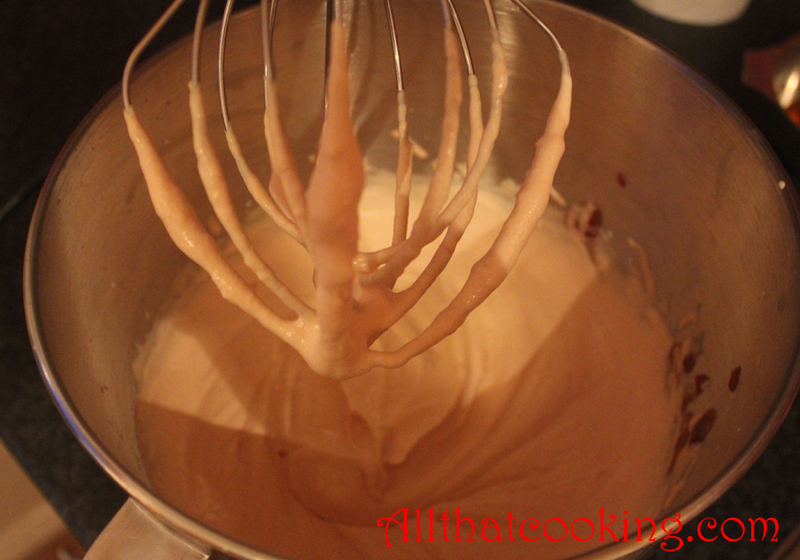 Whip until thickened and soft peaks form. Alternately you can use hand mixer. 5. 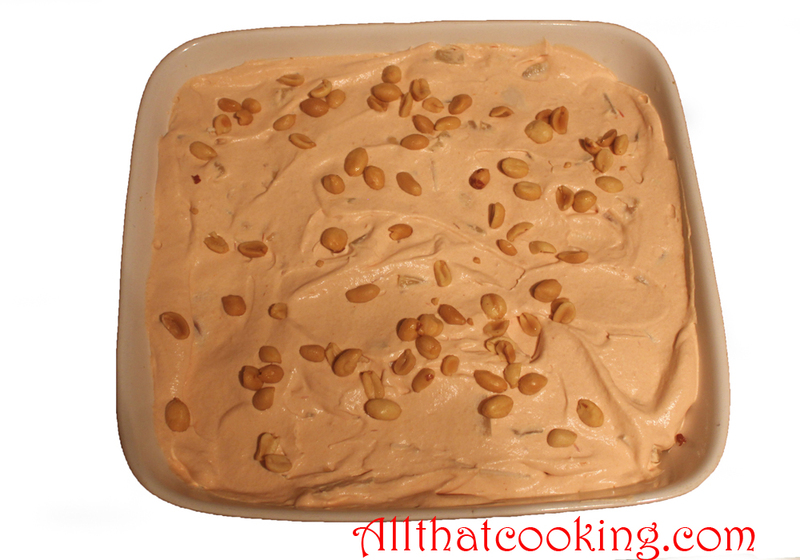 Spread chili cream over chicken and sprinkle with remaining peanuts. Bake at 375F for 40 minutes. 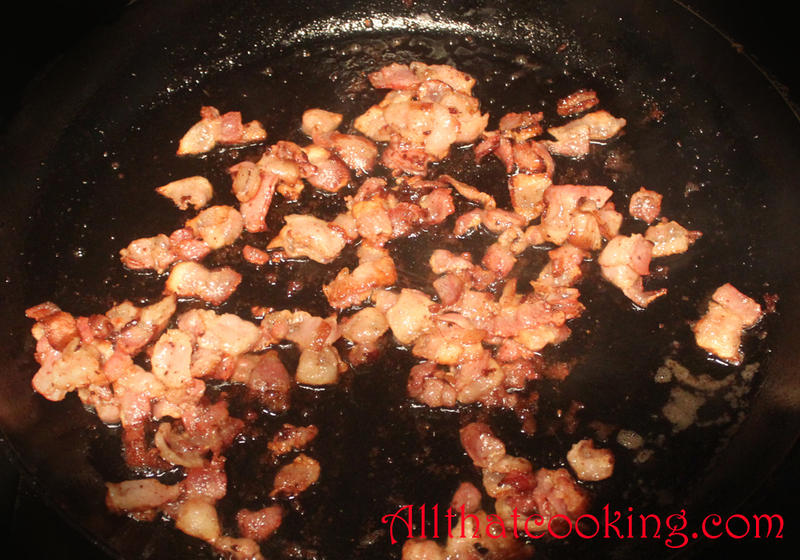 In the meantime fry up the bacon, boil up some rice and make a salad. 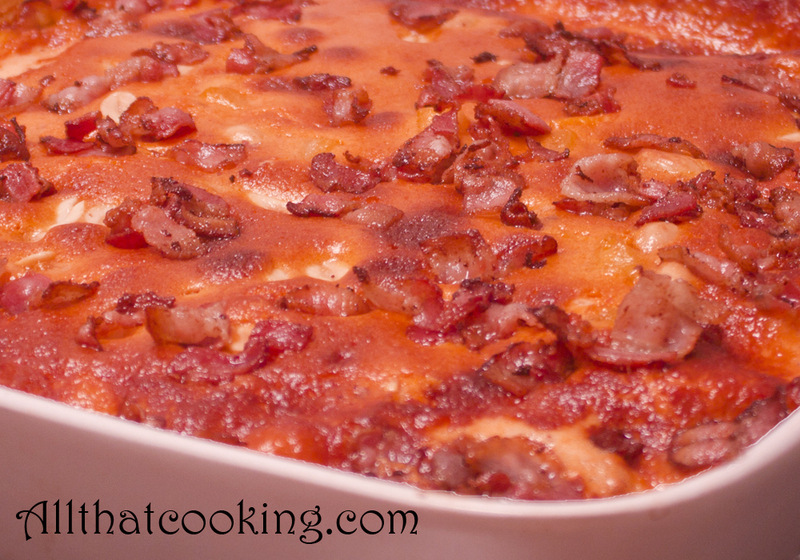 When the casserole is golden and bubbly, top it with the bacon and lower your tray table for dinner service. We bet you’ll become a frequent flyer with Jacob! While we are thankful to have family, friends and a roof over our head there are people in the world who do not. Please remember the homeless in your community who rely on soup kitchens and the kindness of volunteers. Take a moment to reflect on the people of the world who struggle daily for food. There are about 80,000 people in Hampton Roads who have ties to the Philippines. I have friends and co-workers whose families in the Philippines have lost everything. If you are able, please make a contribution to one of the many relief organizations providing food and medical assistance to the thousands of people who are in dire need of help. Gallery | This entry was posted in Main Dishes, Swedish Classic and tagged Classic Swedish chicken casserole, Flygande Jakob, Flying Jacob, retro Swedish classic. Bookmark the permalink. Flying Jacob looks very good and i am taking off and will have it ready for my wifes arrival from Glasgow on sunday, after 4 days visit to Scotland with her classmates since the 1950’s. There are several hundreds Philippines living here in Iceland and donations has been very successful through the Red Cross, UNICEF and the Philippines introducing and selling Philippines cuisines here in Reykjavik. Stenar – you are a gem. Dagrun is one lucky lady! It’s nice of you to say that, but certainly i am the lucky one, because “she is the salt of the earth” . my wife arrived ín Reykjavik on Sunday at 5:00 pm after 2 hours flight from Glasgow, she was rather tired and hungry after 5 hours travelling (2 hours flight) only had breafast at the Hotel. So i was glad to tell her that i had prepared the “Flying Jacob” . She told me, after all the dishes in Glasgow this was the best she ever tasted and a unique dish and we send you thanks and best wishes.